Dr Anita Bhanja GPCert(Derm) CHPV B.Vet. Med. MRCVS qualified from the Royal Veterinary College in 1994 and has lived and worked in Cheshire for over 20 years. Anita is a member of the International Association of Animal Hospice and Palliative Care and the International Veterinary Academy of Pain Management. 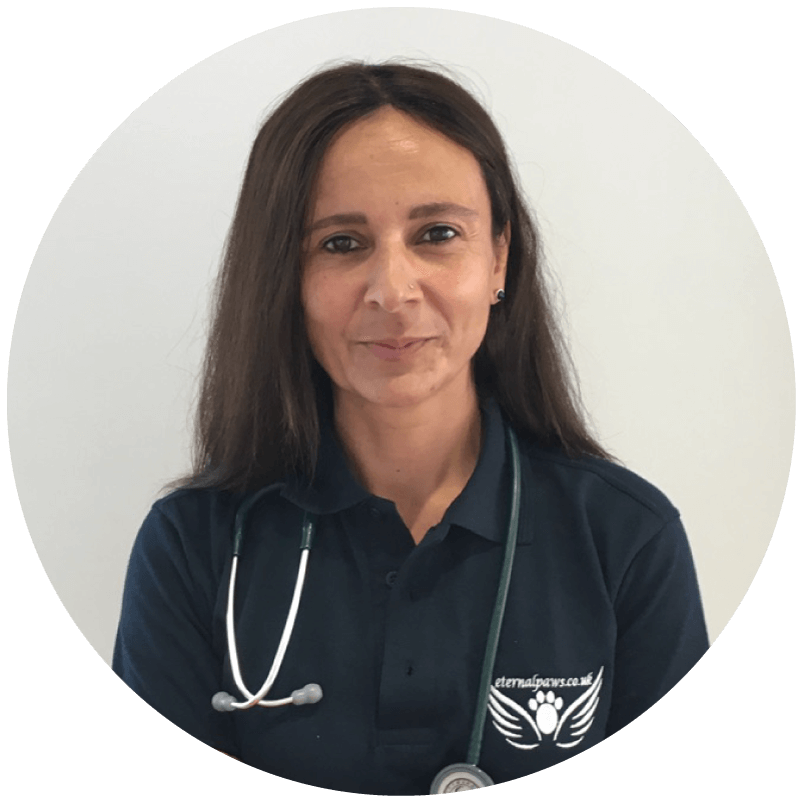 Anita has been working as a mobile veterinarian for 6 years now following on from her Grappenhall practice and day to day sees the need for home care for elderly pets. Eternal Paws has been created, therefore, to provide everything you and your pet need as he or she grows older. It goes without saying that your pet will receive first class and compassionate medical care but also additional services, such as holistic care and access to pet sitters, home help or someone to talk to about illness, old age and what comes next. Anita can also advise on making your home more friendly for your ageing companion. Anita has three dogs, a cat and a snake. Her elderly Doberman, Daisy, has undergone major spinal surgery and has been rehabilitated to a full and happy life despite a poor prognosis and this means Anita is no stranger to the personal trauma of a disabled or ill pet. Or indeed to the sadness and heartache of losing a pet, and the grief this brings, having lost her beautiful dogs Elliot and Coco a few years back and her little cat, Deva, more recently.